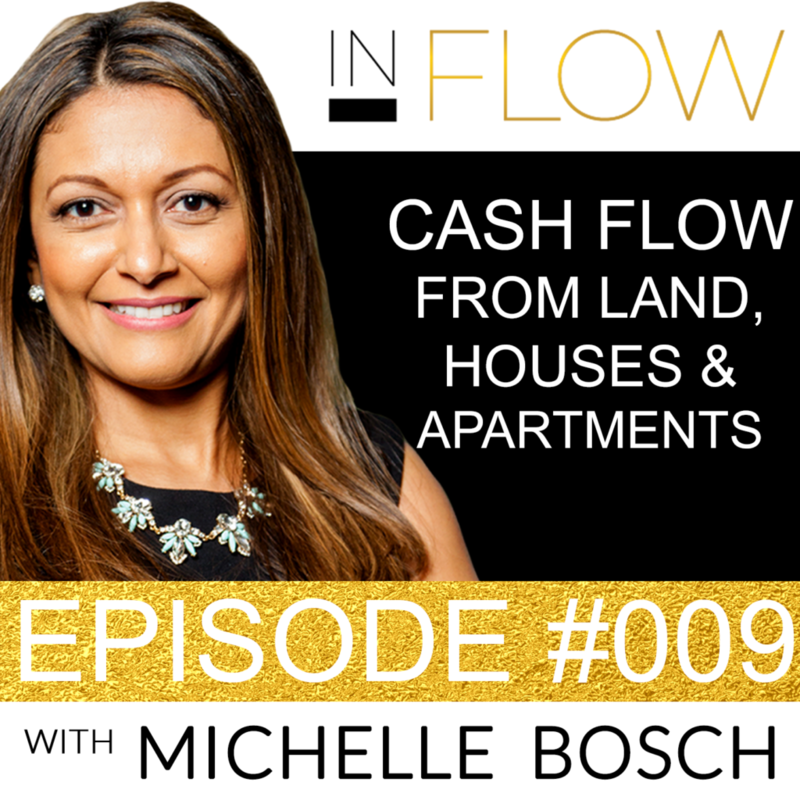 Michelle Bosch and her husband Jack have had an interesting journey with regards to real estate investment and have learned many things along the way. 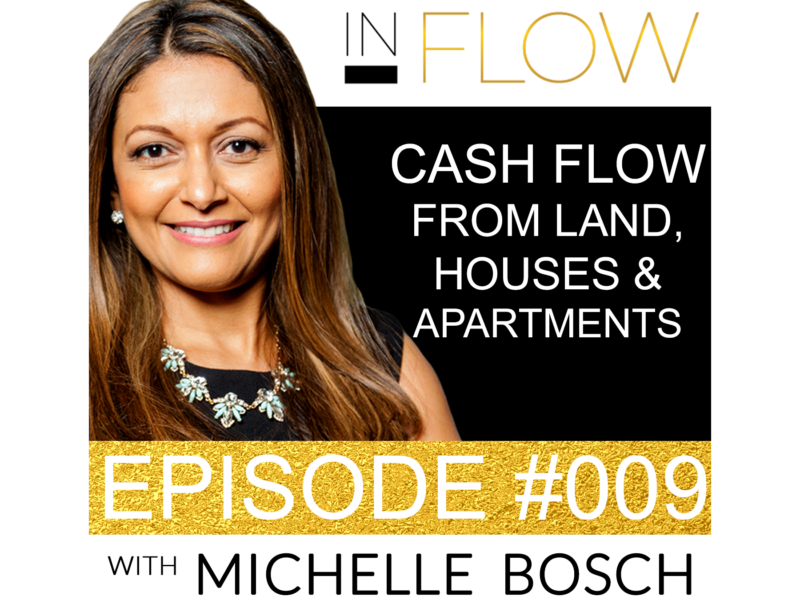 In this episode of In Flow, Michelle talks about the 3 different kinds of property that she and her husband invest in. You’ll find out the pros and cons of each, along with real life examples from Michelle’s life. You’ll also learn more about active vs passive investments and discover how you can forge a path towards the Forever Cash life. If you’ve ever wanted to invest money in real estate but weren’t sure where to start, this is the episode for you! Discover How To Buy Properties At Up To 75% Discounts OFF Market Value From The “Lost Equity” Just Waiting To Be Claimed! http://forevercash.com/offers/_forever-cash-kit/free-kit.php? What Michelle Bosch loves about houses is the fact that nobody calls her because a toilet is broken, instead they call her property management company and they take care of everything. The Difference Between Land, Houses and Large Apartment Buildings. Because our business has followed our personal evolution…as we have grown as investors our asset class and expertise has followed that evolution. I will talk about today 3 asset classes that we have personally investing and continue to invest in for very different reasons. I will do my very best to explain our strategy of using the profits in one of these asset classes and how we roll them over to the other two in pursuit of course the holy grail of all cash which is Forever Cash Flow. I will also discuss for each asset class the opportunities that exist as either a passive or active investor. If you are an active investor it means you are working every day on the hustle of investing and more than likely you are a real estate professional because you actively work this industry through either wholesaling, rehabbing, etc and your take on real estate is much more of a transactional one. Each transaction pays you x amount of dollars and you move on to the next transaction and when you stop, transactions stop and cash stops coming in. If you are an active investor You are actively educating yourself and investing to get your 10,000 hours of mastery under your belt. It is time consuming but if you apply yourself you will succeed in creating Inflows of cash through wholesaling real estate. We belong to a group of 150 of the top active real estate investors in the country and the scale, teams, expertise and success they possess is unparalleled. If you are a passive investor that means you have a cash machine whether in the form of a business or profession that produces a lot of cash or income for you and you then turn around and allocate this cash and invest it in assets that will be bringing more cash passively or what we called Forever Cash Flow. As the word says it… you are passive meaning you are not the one hustling or actively involved in an investment…somebody else that has the expertise, the deal flow, the know how, the 10,000 plus hours of mastery and has the track history of delivering returns and results is doing the heavy lifting for you and helping you invest and have your money do the work for you. As many of you know my husband and I are immigrants into the US and when we came here we didn’t have a clue about how structures such as homes are built here in the US. In Honduras where I am from we usually build with solid concrete blocks that can withstand hurricanes and in Germany where my husband is from they also build differently so that homes can withstand the long cold and wet winters. So for us trying to look at houses or large apartment buildings was simply overwhelming at the beginning of our investing journey almost 17 years ago. What I love about land is that there is no competition. How many times have you heard your real estate peers talk about land? My guess is never…everyone is chasing after houses where competition is super high and you have to do direct marketing of up to 10,000 pieces of mail a week to be able to get a deal and net around $5-$10K. With land you mail a fraction of that and you can net the same and I dare to say the typical spread depending on the area can be more around the lines of $15-$50K and that without to deal with toilets, termites, or tenants. It is really the most simplified version of real estate. You can do everything you do with a home such as flip, or sell with seller financing…just without having to deal with contractors, rehabbing, mold, foundation repairs, roofs, kitchens, etc etc you get the picture. Plus you can buy at huge discounts of 10 to 30 cents on the dollar and turn around and quickly sell also at a discount if you’re selling for cash because there is enough room in the deal for someone else while making a nice hefty profit for yourself. From a type of cash stand point land flipping is definitely one of the superior ways to create one time cash flow with substantial spreads. I mean lets not even talk volume but be very conservative…for most people 5 flips of $25-50K each a year would free them completely out of their current jobs but really what is typical in the land business if you are halfway serious is about 40-60 deals a year. Land is also amazing in that without the complexities of a home you can also create Temporary cash flow because you can sell at TOP dollar using seller financing meaning you become the bank.. You accept a down payment which in most cases covers your cost basis for the property since we get them at such deep discounts and hold the note and someone makes payments to you for 5,10,15 years depending on price range and terms you agree on. And if we are conservative and have 10 such deals where you charge a nice down payment to recoup where you are getting monthly payments of say $500 per month you are creating $5000 in passive cashflow temporarily for the duration of the note…meaning until they pay it off. So land is a great start to investing and creating seed money but it is not what will free you from the rat race forever. BUT I love land…land has been immensely good to us and to continues to be good to us… it is simple, almost competition free, and extremely lucrative and that is why we also teach others how to invest in land. As a matter of fact our next event is coming up on January 18-20 in Tampa, FL so if you are on the fence about making money with real estate get off the fence and come spend a few days with Jack and I in Tampa. You can go to www.michellebosch.com under events and register using the link there. So now moving on to Houses. Houses for us only started making sense back in 2008. The real estate market for houses had tanked the US economy was entering a recession and our backyard, the city of Phoenix was for sale and we were sitting on a ton of liquidity from all our land cash sales and term sales. We had over 400 notes where people paid us monthly and so we decided with Jack to educate ourselves on rehabbing houses for buy and hold purposes and become landlords. We bought a nice size portfolio of houses for anywhere between $30,000 and $40,000 that were worth $150K-$200K and could rent for $800-$1100 dollars per month. We had to learn about rehabbing, estimating repairs, mold, inspections, and improving a property for our buy and hold strategy vs. outright sales. We had to learn about property management, home owner’s insurance, tenant screening, etc but it has been well worth it and this knowledge allowed us to expand into 2 other markets here in the US and be long distance owners that manage through first class 3rd party property management companies. And what I love about houses now as a landlord is the fact that nobody calls me because a toilet is broken but they call our property management company and they take care of everything. Our work is in managing the manager (which we are able to be good judges of good work because we self managed ourselves in the beginning to learn the tricks of the trade and learn from the bottom up) and from a Type of Cash Standpoint houses became our first true source of the holy grail of cash flow which is as you already know from a prior episode…Forever cash Flow. Money comes into our bank account from these rentals…. whether we sleep, are sick, work or not….money or Forever Cash ALWAYS comes in. Now the 3rd asset class I want to talk to you about is Multifamily. Why I love multifamily is simple and that is because this is really the ultimate asset class in real estate in terms of being transformational in creating generational wealth for our investors and their families as well as creating Forever Cash Flow. Our goal in any business venture is not to be transactional but instead to forge long term relationships and be transformational and bring as many people along with us when it comes to creating prosperity. This is at the cornerstone of everything we do. With multifamily Instead of looking at a door at a time like in the single family world…you look at 100 doors plus at a time and it will turbo charge your Forever Cash Flow like nothing else will…So we only look only at apartment buildings that have 100 doors or more because they are big enough to throw enough cash flow from operations to pay investors a super attractive return on their money, pay the conservative mortgage, improve the property, have a full time on site leasing agent and maintenance person who are in turn are managed by a first class property management company. We have aligned ourselves with some the most prestigious, best in class, metric-centric and core values driven property management companies in the country. We as part of our Genius are in charge of asset managing and making sure the repositioning of the buildings is always on track, watching the market, helping catch rental rates to market rates, minimizing unnecessary costs, improving marketing etc so we can meet our forecasted income goals for each property and maximize our ability to improve the property to sell at top dollar and split those profits with our investors. So there are two aspects to these savings. The first one comes when someone invests in a multifamily property like an apartment building… the cash flow returns for investors are literally tax free because of paper loses generated by depreciation. New laws were passed that allow investors to make use of cost segregation studies and accelerate depreciation in the first years of ownership of the asset that mitigate any tax liability for the cash flow returns produced. The second tax benefit comes from you optimizing the property every month and increasing cash flow every month …meaning the asset is going up in value and valuation is based on income so that when we sell the property at a higher price we can also shelter those profits from taxes and defer taxes using 1031 exchanges. Multifamily has a 2 prong advantage when it comes to protecting your income from taxes. I friend of mine generating 8 figures in income texted me and she was completely disheartened to have to pay 7 figures in taxes for money that she has work hard to earned. My recommendation for her was to be much more strategic next year and educate herself so that she can invest part of her active income into assets such as apartment buildings that will allow her to obtain depreciation benefits towards her active income in her current business and shelter the cashflow returns from her investments. No other asset class out there does this as successfully as real estate. So yes, my family has been in real estate since I can remember and will continue to be in real estate, number 1 because we love it and know how to play the game and because no other asset class out there is as conservative, able to take in shocks from the economy, produce the cash flow freedom, solid and tangible, producing incredible tax benefits, and provide homes and value to hard working communities of Americans that need affordable, clean, first in class in housing. So now you might be thinking well sooo what? How does this align with my goals? And to answer those 2 questions you will need to first look at what market are we in and decide which of these vehicles will best accomplish your immediate and long-term financial goals based on the market we are in. Second, you might be asking what are your Lifetime Goals and what season of life am I in?…which also will determine whether you have a short term or long term horizon. Our horizon for example is a really long one. One of my Lifetime Goals is to be a Catalyst for growth for our family, our Business, our Clients and my community and affect even the UNBORN…meaning people I might never meet. Another of my goals is to be a leader for people that are interested in truly changing their financial lives by touching, moving, inspiring and creating opportunities for them to create true generational wealth for their families. From this stand point based on market conditions and as we have evolved as investors it has been a seamless strategy to use Land, Houses, and now Apartment buildings to include so many more people and share in the prosperity that comes from Forever Cash flow in each of these asset classes. So now let me ask you….what are your lifetime goals? What season are you in? What is your Genius and what is your skills set? What do you love to do? And most important think about If you were in the last three years of your life and you were experiencing high levels of energy, health, happiness and well-being, what would you be doing? Why postpone this until the last 3 years of your life when you could be enjoying this right now using these 3 asset classes strategically based on the market we are in? I hope that if you have never considered real estate as a viable asset to truly live a wealthy life, this episode help give you the clarity of land, houses or apartments can do for you. I look forward to spending time with you in the next episode. Thank you for letting me be part of your day today and until the next one.